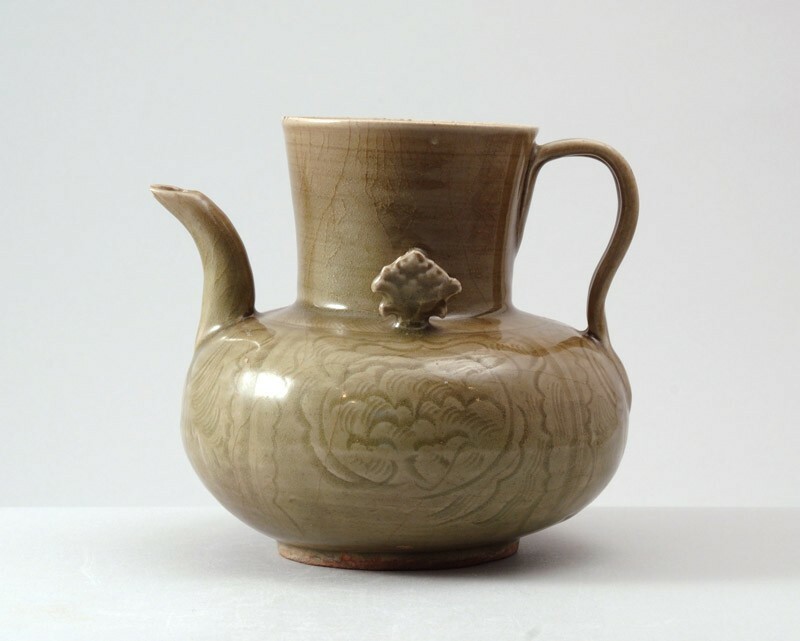 Although superficially very similar to the celadon wares made in north China, the material, carving style and shape of the lugs of this ewer are characteristic of the manufacture of Zhejiang province. During the Northern Song dynasty (AD 960 – 1127), when the capital was situated in north China, the northern kilns was leading in style and were much copied in the south. The southern kilns developed their own style only in the Southern Song period (1127 – 1279), when the capital was relocated to nearby Hangzhou. Ewers of this shape are very rare, but a related fragmentary piece has been recovered from the Dayao kiln site at Longquan. The piece has a depressed globular body on a low, slightly tapering foot and unevenly shaped concave base. The wide neck is flanked on both sides by lugs in form of moulded peony flowers, attached on the shoulder and linked to the neck by a stud. A curved pointed spout is attached opposite a flat curved handle with a double groove. The sides of the ewer are divided into four panels by serrated vertical ribs, those on each side carved with a peony bloom, and those at front and back with foliate motifs, with a hatched border surrounding the neck. The olive-green glaze fully covers the piece except for the footring and base where the body has fired a purplish red.